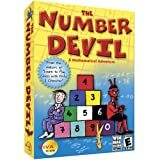 The Number Devil, from the makers of the excellent Learn to Play Chess with Fritz & Chesster, is an ambitious mathematical adventure with an attitude. We found this software program a little difficult to rate, simply because the concept of presenting math tricks and tips is outstanding, but the attitude of the program may be questionable for some parents. Robert is a student whose attitude toward math is less than desirable. His teacher dishes out math problems without explaining the meaning behind them, and Robert thinks mathematics is child abuse. The Number Devil appears in a series of dreams, and each dream is a math lesson, complete with explanations of math concepts, exercises, and games. This theme may be cute for some, but questionable for others. At many points during the game, Robert and the Devil spar, and the Number Devil says such things as, "Wrong!" and "you pipsqueak!" to Robert. As the sharp-tongued character says himself, he's the Number Devil, not Santa Claus. The idea behind the use of a Number Devil is the fact that numbers can be rather devilish, but if you learn their tricks, you can actually have a bit of fun with them. In this game, square roots are rutabagas, and prime numbers are prima-donnas. What the game does well is it offers kids some meaning behind rather tricky math concepts, the chance to exercise these skills, and the chance to play some games that help build on these newfound skills. The program leaves some room for children to "play" with numbers on their own, as in te third night's lesson. Kids can enter any number they want and the computer will tell them whether that number is a "prima donna" (prime) number. One of testers' favorite games is found in the first dream sequence. Kids are offered a quick peek at a group of objects (such as bunnies, bugs, and coins), and then need to guess how many objects they saw. During the lessons, children are asked whether they'd like to solve the given problems, or if they want Robert to do them. Topics include the number zero (which is a very "sophisticated" number), Roman Numerals, prime numbers, roots, and more. It's all a dreambut a very educational one! Offers math tricks and explanations behind tricky math concepts. Theme and dialogue may be questionable to some parents. Although the math lessons are generally strong, a few of them didn't offer enough explanations for our testers.